BANGI, 17 Okt 2012 – The Institute of West Asian Studies (IKRAB) of The National University of Malaysia (UKM) held a ‘2012 IKRAB Week’ here recently to strengthen ties between its academic and other staff members with its students. Various programmes were held in the first of such an event held highlighting all things West Asian including cultural performances of the region and Malaysia, a seminar and an exhibition. A student from Palestine, Aida Koni said the programme was most interesting and has brought about closer ties with other students and the community thus enabling her and her collegues from the West Asian region to learn more about the rich cultural heritage of the country and the wide varieties of Malaysian foods. 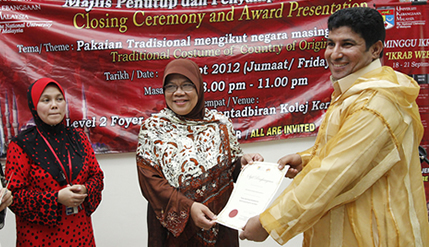 The closing ceremony officiated by IKRAB Director, Professor Dr. Siti Rugayah Hj. Tibek saw presentations of cultural shows and a rendition of the popular regional song ‘Rasa Sayang Hei” by the foreign students. A seminar was also held to enable post graduate students of IKRAB to present their research findings. Ali Abdulkareem, a student from Libya hopes such programmes could be planned on a bigger scale in the following years to enable all in UKM to attend and understand cultures of the West Asian region as experienced by Indonesian student, Fatma Taufik.